Thanks for the post. Looks like I have severely damaged a large laurel oak tree in my backyard by generously using Scott’s weed-n-feed for the lawn under neath it. Unfortunately all of the leaves in the canopy are brown and burned, I suppose. 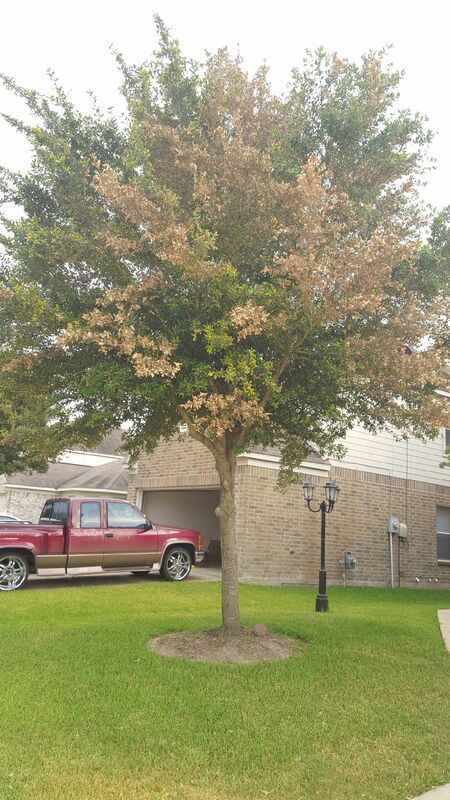 There are very few leaves in small branches in lower trunk that are still green, but they also don’t look healthy. I have had a couple of tree guys, but they couldn’t find an explanation and suggested to take it down. I just remembered that I had fertilized the lawn extensively to revive the grass. After googling my guess, I landed on your page. Any chance that the tree might come back even though I applied a liberal amount of weed-n-feed in last month in spring? I applied it in the worst possible time…. I’m really not familiar with laurel oaks, they don’t grow here in our area. I have seen some trees bounce back. It is uncommon and they generally still look very poor (sparse foliage). Only time will tell. Apply liberal amounts of compost tea and any other soil activator products you can get at your local garden center. Getting the soil to eat the chemicals is the best way to combat the issue. Half of the tree’s leaves have turned yellow and brown and are flying off like it’s November. The other half is green which I expect is due to the fact that part of the tree hangs over a neighbors wall and was spared my Herbicidal error. Question: Assuming the tree pulls thru – will the leaves return this year? Question 2: If the leaves don’t come back, ii it safe to prune off the tops of tree this year and wait for next spring? Avoid pruning the first year. Do your best to stimulate microbial activity in the soil. Try to leach the herbicide from the soil with excessive watering. Leave it alone (pruning wise). Do your best to stimulate microbial activity in the soil and try to leach the herbicide out with excessive watering. I applied Bayer Weed and Crabgrass Killer on my lawn during the growing season and my 3 linden trees leaves grew in sparsely and those that did grow in are curling, look dehydrated and are wilting. Does this sound like herbicide damage? If so, do trees with herbicide damage die? I read above that I need to stimulate microbial activity in the soil and excessive water. Do I do deep root watering or surface watering?